Moving is one of the more exciting experiences in life -- as well as one of the most stressful. Unless you keep a spartan home, you’ll spend seemingly countless hours sorting, packing and moving boxes. The only alternative is to hire moving professionals to do it for you, and depending on the type of move, that can be a huge expense. One way to make things easier on yourself is to sell some of your belongings before you go. That not only leaves you with less to move, but it can put some cold, hard cash in your pockets to help with moving expenses or buying new things to match your new space. It’s also the perfect excuse to play shopkeeper with a blowout garage sale, which can be as entertaining as it is profitable. But that leaves a series of questions: Sell it? Move it? Donate it? Trash it? Let’s look at what should stay and what should go. Move It or Sell It? Unless you’re looking for a completely fresh start, chances are you’ll be keeping a lot of belongings. There are the essentials, like your computer, the kitchen appliances you use every day and your favorite clothes. Then there are your really valuable items, like fine art and jewelry. And finally, there are the items with sentimental value. These things justify their own place in the moving truck. Decisions get tougher when you move onto other categories, like things that are old or worn. If you’ll need to replace them soon anyway, it’s often best to get rid of them now and buy the replacement after you move. There may also be things that don’t have enough monetary value to justify spending money and effort to take them with you. And there will inevitably be a load of inexpensive everyday items like office supplies, cleaning supplies, food -- pretty much anything you can get at the grocery store. Large furniture. If it’s very fine quality or has great monetary value, like an antique armoire, you can make the case for moving it. But even if you love your broken-in sofa, you’ll pay a whole lot to move it a long distance. Get the best possible price for it and buy a new one that you can have delivered to your new front door. Kitchen clutter. This can be challenging, because you don’t want to sell your cheese grater only to buy an identical one in your new city. But almost every kitchen has a few never-used gadgets or appliances that won’t be missed. And if you have inexpensive dishes and glassware which are heavy and fragile, you can save yourself a huge headache by spending your garage sale revenues on a new set. Books. You read it once; are you really going to read it again? Or maybe you never read it and probably never will. Books are heavy, bulky and usually only valuable to people who will read and enjoy them. Moving is the perfect time to pare down. CDs and DVDs. The future has arrived, and it’s left disc media behind. If you have a big box of discs but only listen to Mp3s and stream your movies and TV, it’s time to let go. Old clothing. If you’re not the type to audit your closet every year, you might have some old duds that are either out of style or no longer fit. If you haven’t worn it in a year, it should probably go in the sale bin. Look for pricing references. Search online resellers like eBay and Craigslist for items similar to the ones you’re selling to get an idea of the prices they’ll command. Another way to price your used items is to look up the cost of a brand new equivalent and discount it by 50 percent. Set a minimum selling price for everything, but keep that information in your head. 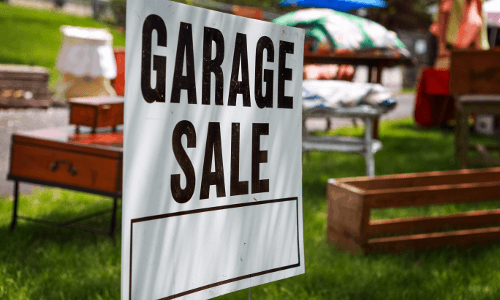 This will help you make better decisions when customers haggle, which is part of the garage sale tradition. Secure a garage sale permit, if applicable. If you’re unsure of your local policy, check your municipality’s website or call your city hall to inquire. Schedule your garage sale on a Saturday or Sunday, and be prepared to change plans if the forecast shows inclement weather. Not only will that deter crowds, it will expose your belongings to the elements. Use multiple means of advertising: post signs along the major roads and busy public places nearest your house, place free ads in online classifieds like Craigslist, and spread the word through neighborhood social media groups. Depending on where you live, it may also be cheap to post a small ad in your local paper. Make sure you have lots of change and one- and five-dollar bills on hand the day of the sale so that you can make change. When the sale is over, there may be a few things left over. And since you’ve already committed to getting rid of them, consider donating them to charity rather than taking them with you. If you have a few favorite local charities, check their websites first to see if they accept the types of donations you have. If you need more options, use an online directory like DonationTown to find out which charities accept donated goods in your area. Some charities will come to you and pick up your donation, which can really come in handy if you plan to donate furniture or other large items. 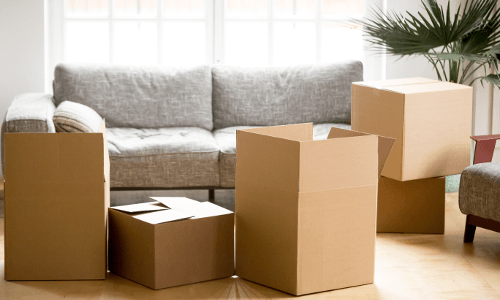 It’s hard to say goodbye to the places you’ve lived and the things you’ve lived with, but selling or donating your old belongings can make your move so much easier. 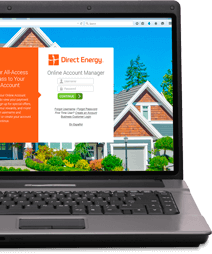 If you do choose to host a moving sale, Direct Energy wishes you good weather and big crowds!